signed on obverse and dated and inscribed on the revere Portrait de / My Lord Duc/de Wellington/ Par Rochard/peint a Bruxelles/12 Juin 1815. In 1815 Rochard went to Brussels to escape conscription and through an introduction from the Spanish Ambassador, General Count Don Alva, a friend of the Duke of Wellington, had been commanded to paint a portrait of the Duke for King Ferdinand VII of Spain. On the eve of the Battle of Waterloo, Rochard went to the Anglo-allied headquarters and painted the Duke. In fifty minutes, he painted three watercolour sketchs of different poses which he later worked up into portraits and charged Wellington 120 francs each. It would appear that this portrait dated 12 June 1815 Brussels, is the sole version which was certainly painted on the eve of the Battle of Quatre Bras and Ligny. Other versions of this portait are in Stratfield Saye House, nos. 182 and 183; Sotheby’s, 11 December, 1978, lot 142, signed and dated 1815; and Sotheby’s London 25 June, 1979, lot 67 (given to Lady Georgiana Lennox, later Lady de Ros on 22 June 1815); and Bonhams, London, 5th November 2002, lot 113 and dated 1815. 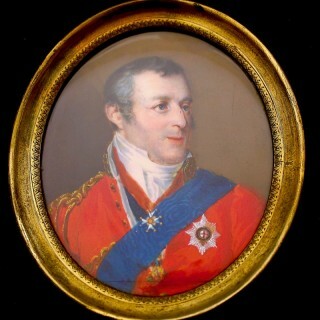 Charles, Duke of Richmond and Lennox, from whom this miniature has descended participated in the Napoleonic Wars and in 1815 he was in command of a reserve force in Brussels, which was protecting that city in case Napoleon won the Battle of Waterloo. On 15 June, the night before the Battle of Quatre Bras, his wife held a ball for his fellow officers. This glittering celebration became famous, and Thackeray immortalised it in Vanity Fair. 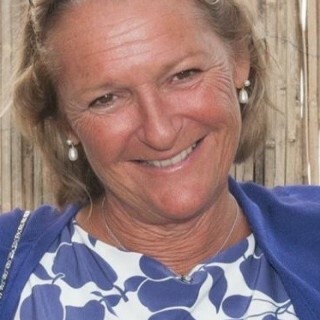 By descent from Lady Louisa Tighe (d.1900), fifth daughter of Charles, 4th Duke of Richmond and Lennox (1764-1819).